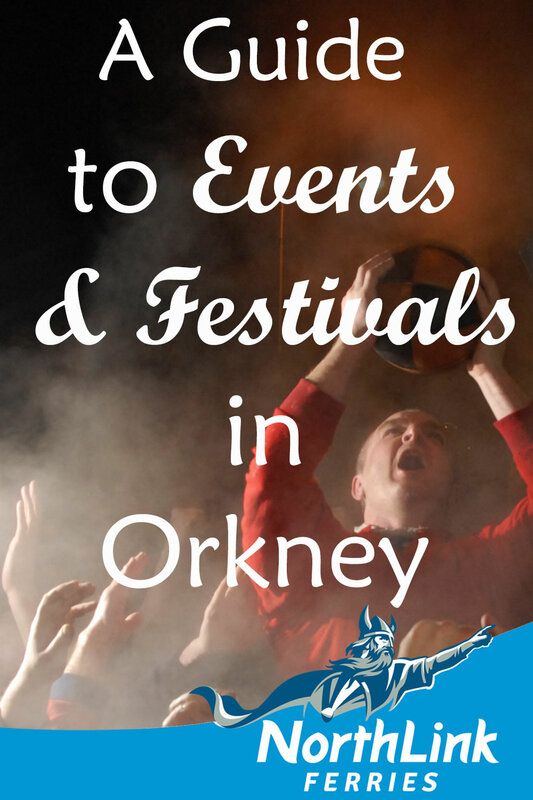 Orkney has a packed calendar of diverse events. We’ve collected a list of annual events and festivals, from summer agricultural shows to the mass yuletide game ‘The Ba’. With classical, jazz, rock and traditional folk music mixed in between, Orkney has every possible taste covered. A great passion in Orkney is amateur drama, and each night of the SCDA (Scottish Community Drama Association) Orkney District One Act Play Festival two or three one-act plays from various Orkney Community Drama Clubs will be performed. Each night promises great joy, heartache, comedy and drama – and that’s just the judging at the end! A weekend of dance workshops and ceilidhs are held over the three days in and around Kirkwall. Come along for a birl – it’s great fun, there’s first-class ceilidh music from local bands and you may even learn a few new dances. The Orkney Nature Festival has a brilliant diary of activities and events which celebrate the wildlife and wild places of Orkney. Activities include boat trips, guided walks, fascinating talks, and many events are family-friendly! The annual Norway Constitution Day Celebrations in Kirkwall celebrate the close ties between Orkney and Norway with a service and concert in St Magnus Cathedral and a parade through the street. Come and see the Norwegian visitors in their traditional outfits. The Orkney Folk Festival began in 1983 and is now regarded as one of the best and friendliest festivals in Scotland. Based in its spiritual home of Stromness, there are also events elsewhere in the islands. Whether you enjoy a lively toe-tapping pub session or an energetic ‘stomp’ – Orkney Folk Festival attracts visitors and a stellar line-up of artists from all over the world – so make sure you book your tickets in good time! The Hoy Half Marathon and 5k Family Fun Run is a friendly annual event set amongst some of the best scenery Orkney has to offer! Runners start outside the lovely valley of Rackwick and run to the North Walls School. Make sure you register for this challenging but rewarding run in good time! The St Magnus International Festival is a celebration of the arts which brings international orchestras, recitalists, theatre, dance and literature to the Orkney Islands for six days around midsummer and is renowned for its unique blend of world-class performance and community participation. The St Magnus Marathon is a popular new event. Runners start in Kirkwall, at the St Magnus Cathedral, and finish in Birsay at the Birsay Community Hall. This challenging marathon is accompanied by a 5km “Fun Run”, children’s entertainment and a ceilidh that night! Stromness Shopping Week began shortly after World War II to attract shoppers to Stromness after the lean war years. Shopping Week continues as it began with events for all the family organised by local volunteers. The week ends on Saturday night with a parade of floats and fancy dress through the town, followed by an open air dance and a fireworks display. A programme of events is available to buy locally from mid-June. Orkney’s main industry is farming; it provides employment for a quarter of the workforce in the islands. The agricultural shows in August are the high points of the farming year and are brilliant days out for all the family. Farmers wake up early on the morning of a show to display their best stock. Cattle, Sheep, Poultry and other animals are groomed to look their best in order to make off with a winning rosette! There are also stalls run by Orkney businesses and organisations, fun fair rides, trade stands, horse riding competitions, sheep dog trials, vendors selling delicious Orkney food and drink and much more! An annual rally run by the Orkney Vintage Club which showcases vintage and classic cars, tractors, motorcycles and engines from the past. Farm implements, collections of models and interesting artefacts from a bygone era are also on show at the Orkney Auction Mart. The Riding of the Marches sees the streets of Kirkwall filling with horses, ponies and carriages. The riders travel in a procession to mark the old boundaries of the town. They take a circular route, from Broad Street to Scapa Beach and back. This event has roots in the past but was revived in 1986, the 500th anniversary of Kirkwall being granted the status of a Royal Burgh in 1486. This traditional event dates back to the 1800s and begins at the St Margaret’s Hope School where horses and ploughmen are judged. Young lasses don family heirlooms – traditional Clydesdale horse decoration – and these colourful displays are quite a sight to see! Then the competition moves to the beach at the Sands O’ Wright, where the boys must use vintage miniature ploughs to carve a straight furrow in the sand. A fairly new addition to the Orkney calendar, the Orkney Rock Festival has quickly grown in popularity and presents a head-banging, foot-stomping, rip-roaring line up of local and visiting artists. Expect the volume to be turned up to eleven! Melding Orkney’s environment, history, skies and culture with scientific insights makes the Orkney International Science Festival a really unique event. World class speakers visit, and there are science talks, hands-on experiments, demonstrations, bus tours, ceilidhs, good-humoured lively discussion and workshops for adults and children alike. Attendees have come to expect a fascinating range of topics for curious minds every year! A friendly and fun weekend of Blues which primarily takes place in Stromness. The Orkney Blues Weekend features the cream of blues artists from Britain as well as many exciting local bands and performers. It is fitting that the Orkney Storytelling Festival should take place in October as, in the past, Orcadians would have listened to tales around the peat fire as the nights grew darker. The programme of events for the Orkney Storytelling Festival includes walks, talks, story sessions and workshops with renowned international storytellers and familiar local faces! In Orkney on Christmas Day and New Year’s Day there is a roar under St Magnus Cathedral as a surge of men, a freak wave of bodies, washes up to meet The Ba’, when it is thrown in the air! The ba’ then disappears amidst a huddle of men, amongst grappling hands and is held tight against chests, with steam rising from the crowd! Every now and then there will be a breakout from the scrum – when one of the teams (the Uppies and the Doonies) rush towards their goal. The Boys Ba’ starts at 1000 and the Men’s Ba’ begins at 1300.